There are many individuals contributing to the field of respiratory therapy who I may not know about as I have been practicing in the field for only a few years. In my journey to learn more about this field and the people involved, I reached out to Mr. Andrew Wroblewski. 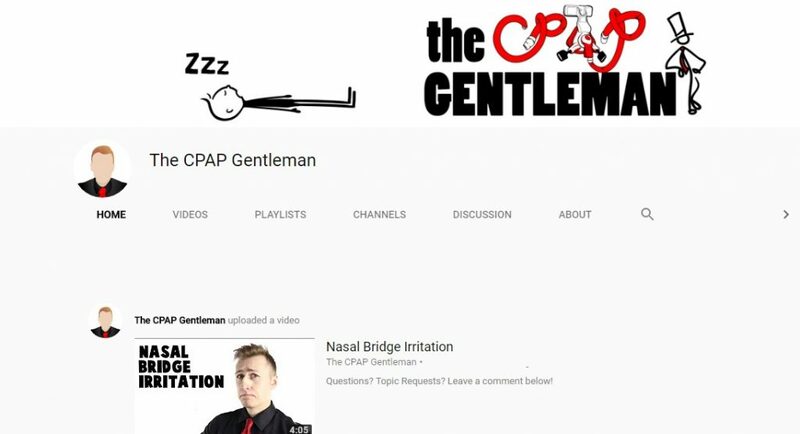 Andrew is a Respiratory Therapist and producer of a successful YouTube channel called ‘The CPAP Gentleman’. He has used his work experience of helping Obstructive Sleep Apnea, OSA, patients to create educational videos for patients. He has summarized and simplified relevant information into entertaining segments. The topics range from “What is Sleep Apnea?” to “Nasal Bridge Irritations”. His first YouTube video dates back to Feb 2016. He is a dedicated, driven and successful RT who is contributing to patient education and the growth of our field. He was kind enough to answer my questions. 1. How did you find out about the respiratory therapy field? What made you decide to become an RT? I found out about the profession through a friend of my father’s. He graduated into the field about a year before I started, and currently works in the Hospital for Sick Children in Toronto. I was one of those guys that had no idea what to do with his life upon finishing high school. My strengths and interests were in Biology and Physiology courses, so my parents and councillors suggested I go into healthcare. Respiratory Therapy seemed like an outgoing field with many different areas to work in. 2. a) Can you tell us a little bit about your YouTube channel? How did you come up with the idea? How did you get involved with it? After many real-life encounters with actual patients diagnosed with sleep apnea, I grew to learn of the common issues people face with PAP therapy. Some were even fearful of the treatment, so I wanted to re-assure them and others in the world that sleep apnea was nothing to be scared about. The only way to do this was to educate them in a fun and informative way. And thus the character was born. I believed that YouTube was the best option to communicate my message, and something that wasn’t being utilized to its fullest potential by other clinicians. I aimed to fill that void, and if I could help just one person by doing it, it would be worth it. 2. b) What are some of the challenges and satisfactions of making educational videos? Time, time, time. Everything from coming up with script ideas, to video production, and post-editing takes up a lot of my free time. I don’t always produce in a noise-free environment either, so extra care needs to be taken to ensure videos come out in respectable quality. I hold myself to a certain standard, and strive to improve things whenever I can. The satisfaction comes directly from the people I help! I get a big smile on my face every time someone leaves a comment thanking me for my efforts. It also gives me the motivation to continue doing what I do. 2. c) How much time is required in making an educational video (roughly how much time is spent in research/script, recording of the videos, and editing)? Where do you find the time to do that in your already busy schedule? It really depends on the topic I’m covering. Generally the research/script takes the most amount of time. If I’m very familiar with a particular topic, I can produce a script in a single day. If it’s something I’m not too sure about, it may take upwards of a week or more. Video production generally takes anywhere from 2-6 hours depending on the length of what I’m discussing. Video editing takes a similar amount of time. Sometimes I’m stubborn and I want things a certain way, so there’s been times where it’s taken days. I don’t know where I find the time! I have many things going on right now from participating in multiple on-call programs to learning a new language. That’s probably why I’m only able to produce an average of one video per month. Hopefully my subscribers don’t mind! 2. d) Any thoughts/suggestions/comments for those who are thinking of starting their own educational related videos? I would highly encourage others to participate in video production for the purposes of education. YouTube is a great avenue through which to do this, and also easily accessible through all hours of the day. I would recommend to start simple. Perhaps audio only, and images that relate to what you’re discussing. This way you don’t have to stress out about learning everything from proper lighting, sound production, and video quality. Not to mention, editing is a little more complicated when there’s a real person in front of the camera. You’ll also save a lot of money! Cameras, lighting, microphones, backdrops…it all hurts the bank. But I’ve already healed from those wounds so it’s okay. 3. You work in the home oxygen and CPAP settings; Any advice or recommendations for RTs who are thinking of or may consider working with OSA patients (i.e. CPAP)? Most OSA patients that you deal with, are for the most part, healthy. This is a far stretch from other environments respiratory therapists work in such as intensive care, emergency, and operative departments. This allows you a relatively stress-free environment where decisions do not have to be made quickly. You’re also able to communicate with your patients more effectively as they are fully alert and able to breathe on their own. I do recommend working on your customer service and interpersonal skills, as this will go a long way in developing a relationship of trust between you and your OSA patient. 4. You have vast knowledge and years of experience in improving the quality of sleep of your patients. Any advice for Healthcare Professionals (HCP) (i.e. How can they improve the quality of their sleep)? Don’t drink coffee or workout too late! It can be difficult to fall asleep otherwise. And finally, if everything else is in check but you’re still feeling tired, make sure you get referred for a sleep study. You may have an undiagnosed sleep disorder that is effecting the quality of your sleep. 5. Any final thoughts or message you like to share with RRTs and HCP? Do what interests you in your respective field. I know that seems sort of obvious, but many of us work in areas we don’t necessarily want to work in. This can be a result of the current job market and what’s available, or what others think is best for you. In the field of respiratory therapy, acute care is highly prioritized above all else. Home-care is sort of an after-thought. I personally had just two days to experience the home-care setting during my clinical rotations, but that was enough for me to make up my mind. Don’t worry about passion, or lack thereof. Passion behind your work comes from experience, and a supportive environment. Work hard, play harder. Thank you Andrew for sharing your views, recommendations and perspective. Keep up the great work!